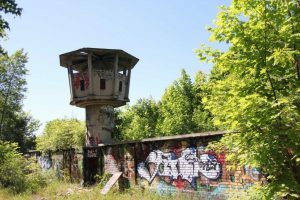 Tucked away on Erna-Berger-Straße, a dead-end street a stone’s throw from Potsdamer Platz in one of the most touristy corners of Berlin, a former Berlin Wall watchtower stands as a reminder of the city’s divided past. 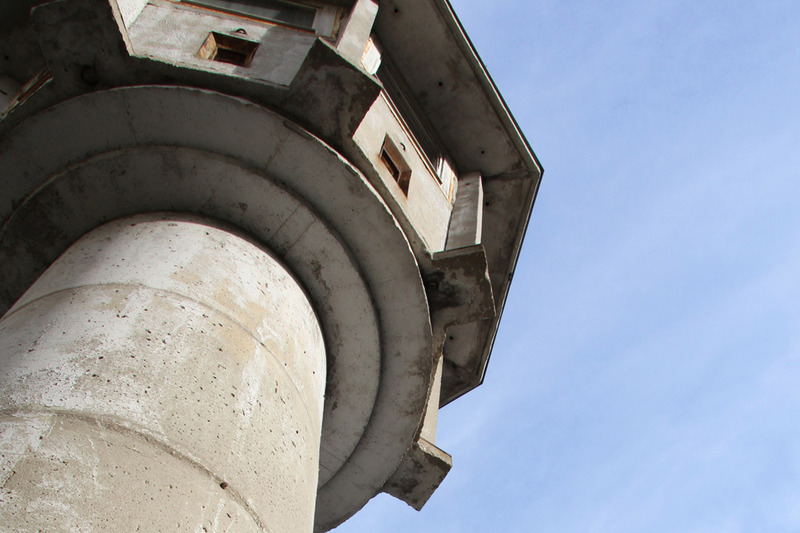 Like the wall, the watchtowers along its length were improved over the 28 years that they were used to guard it. 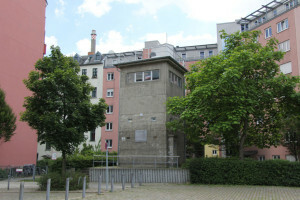 The watchtower on Erna-Berger-Straße is a 2nd generation design, a Rundblickbeobachtungsturm (panoramic view observation tower), specifically a BT-6. 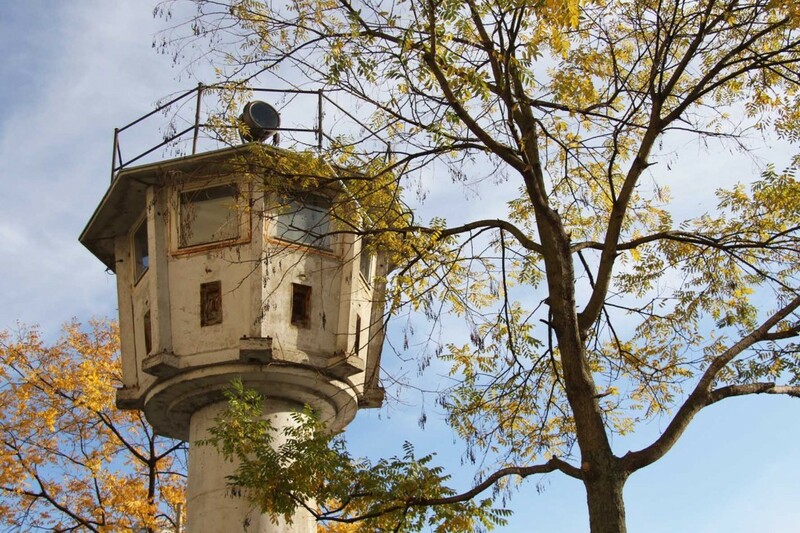 The first watchtowers erected after the construction of the wall in 1961 were made from wood and resembled the Hochsitze (raised hides) familiar to anyone who has taken a drive into the Brandenburg countryside. Realising that guards in a wooden tower were vulnerable if they came under fire the VEB Zentrales Entwurfs- und Konstruktionsbüro des MfNV Berlin, a company responsible for centralised planning and construction in East Germany, created a new version from concrete in 1966. The new towers were formed of an 8-sided enclosed observation deck and a series of concrete rings 1m tall that formed a round column. 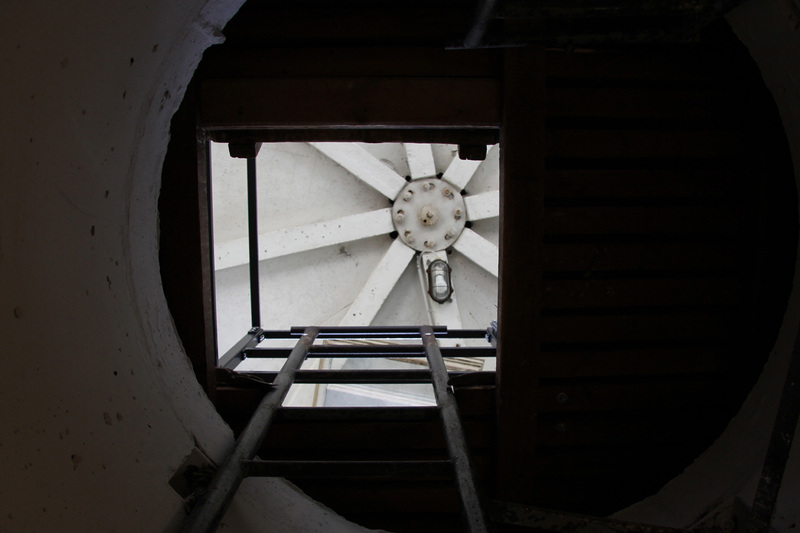 The number of rings used would vary depending on the required height of the tower. 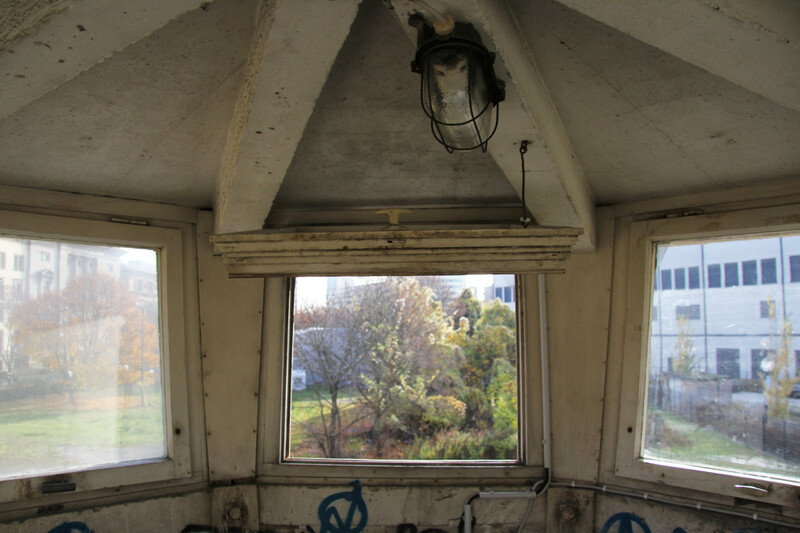 BT-6, BT = Beobachtungsturm (observation tower), indicates that 6 concrete rings were used. While it was a considerable improvement on the earlier wooden platforms, the new design was not without flaws. 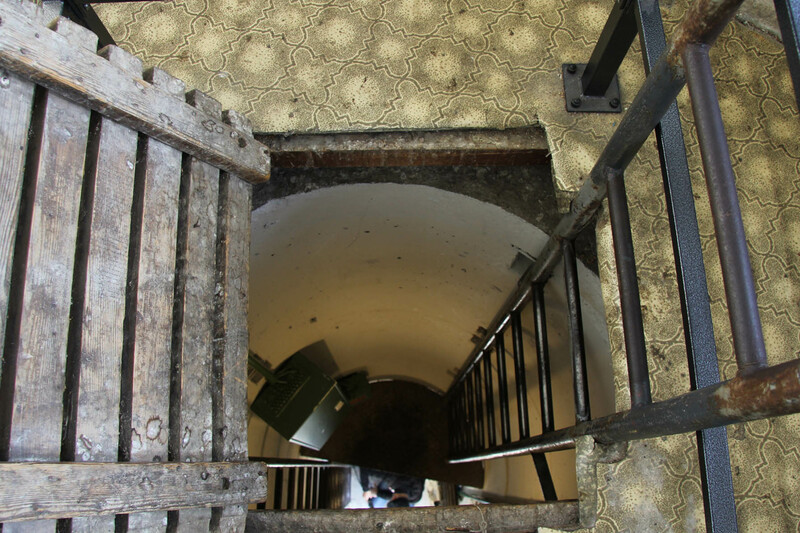 Like its predecessor, the tallest examples were unstable and the narrow shaft served by two ladders made it difficult for soldiers carrying assault rifles to exit quickly. As a result, a new and improved square tower was introduced in 1972 (more of that in a future post). 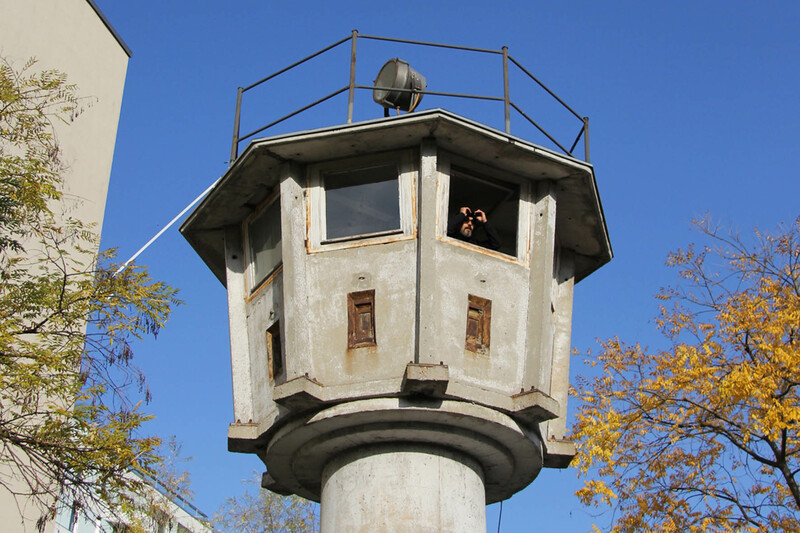 The BT-6 watchtower near Potsdamer Platz was built in 1971 and was manned around the clock by 2 soldiers, one facing east, the other west, armed with AK-47s. 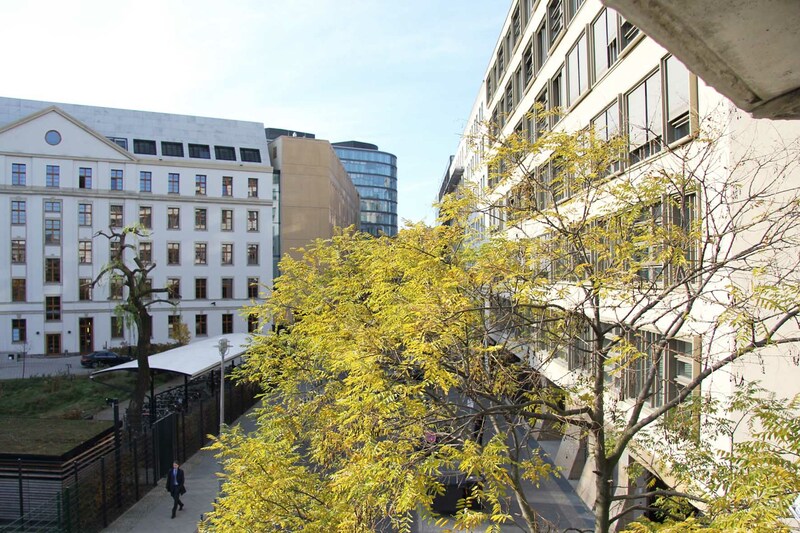 It was their responsibility to watch over the land around the Haus der Ministerien (House of the Ministries) now the Bundesfinanzministerium (Ministry of Finance). Of the 302 watchtowers guarding the Berlin Wall at the time of its fall in 1989, 200 were BT-6s. 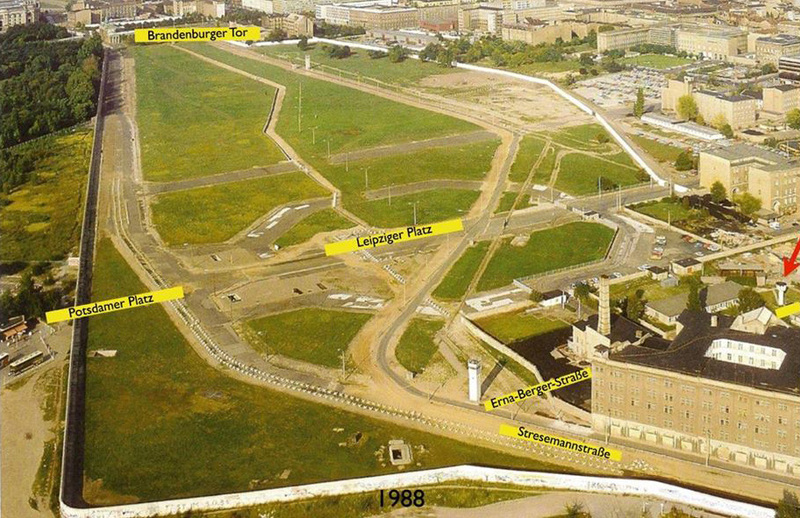 Most were dismantled soon after but this particular tower probably survived because the area around it remained a wasteland for many years (Erna-Berger-Straße didn’t even exist in 1989). 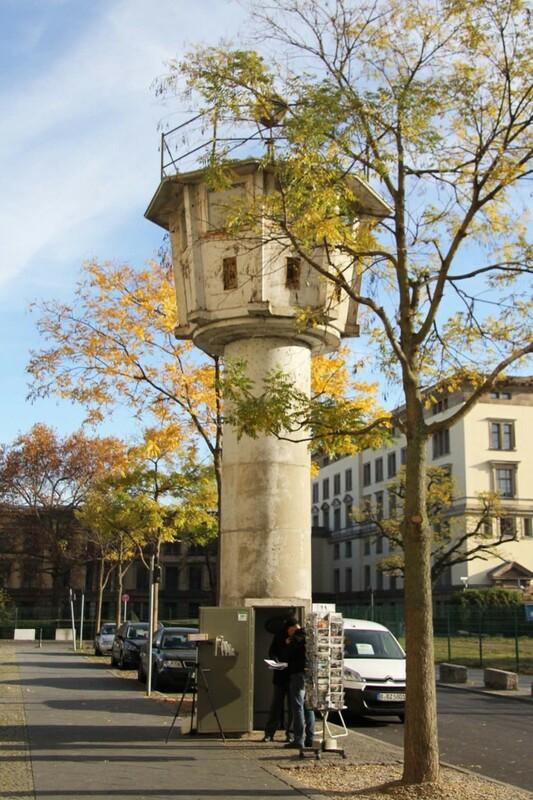 In 2001 the tower was moved about 5 metres in order to allow access to a garage in the newly erected buildings on the street and placed under Denkmalschutz (protected building status). 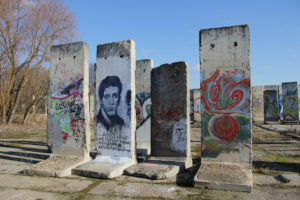 It was unloved until 2011 when Jörg Moser-Metius and his Berlin Wall Exhibition UG were granted permission to restore it. With the gracious assistance of some local patrons and several vocational education shops a large number of details, some visible, many not – were attended to: New electricity and communications cables were pulled in, the concrete was reinforced and patched-up, the massive steel door was brought back to originality, glass panes and their frames were replaced, a lightning rod had to be installed, the entire roof got a good work-over (replete with hatch, guard-rail and searchlight), and finally, a video camera system was fitted for property protection. 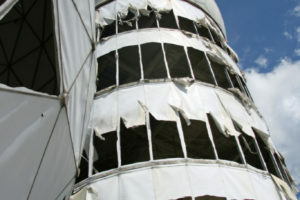 The tower was opened to the public in May 2013. This is just the beginning of Moser-Metius’ plans for the area, which include a high tech visitor centre in an enlarged replica of the watchtower opposite with an immersive 3D experience. 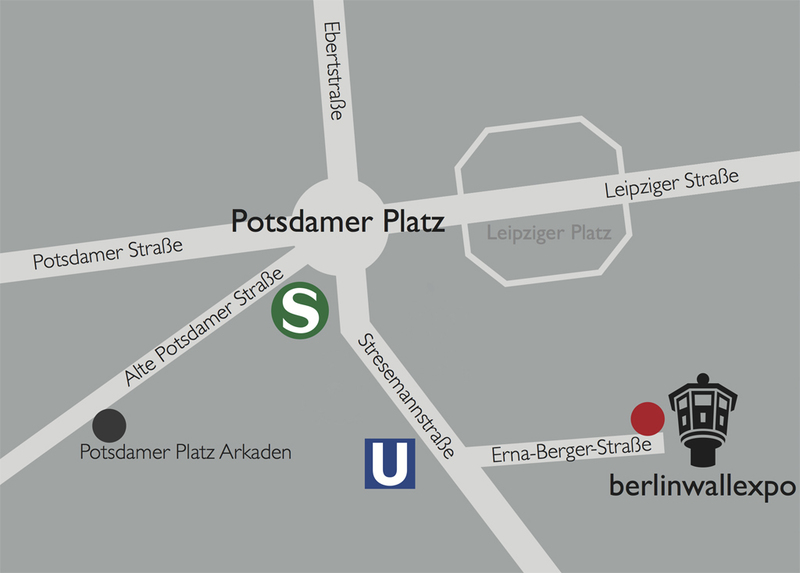 The modern buildings at Potsdamer Platz sink into the ground and the old wasteland comes back into view. It is night. In the emptiness outside, the border strip is brightly lit. 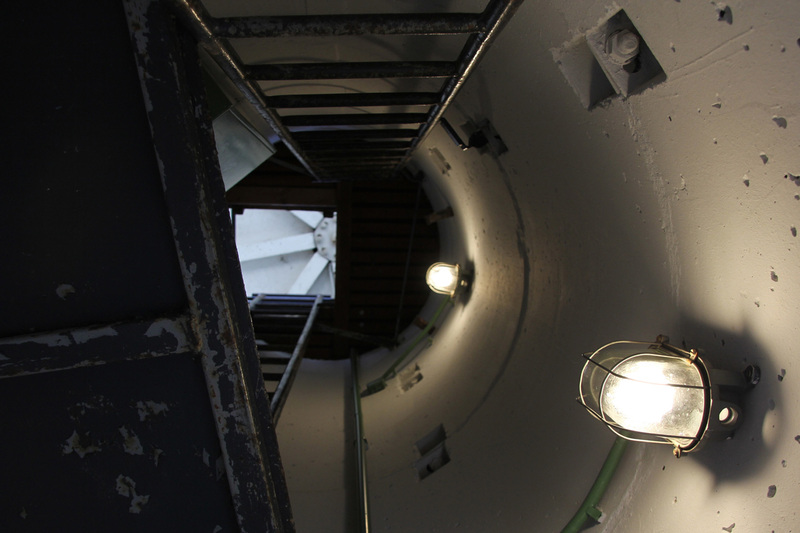 From twelve metres up, visitors look around at the death strip, the security systems and the two halves of the city. An escape attempt is shown, the changing of the seasons, day and night. 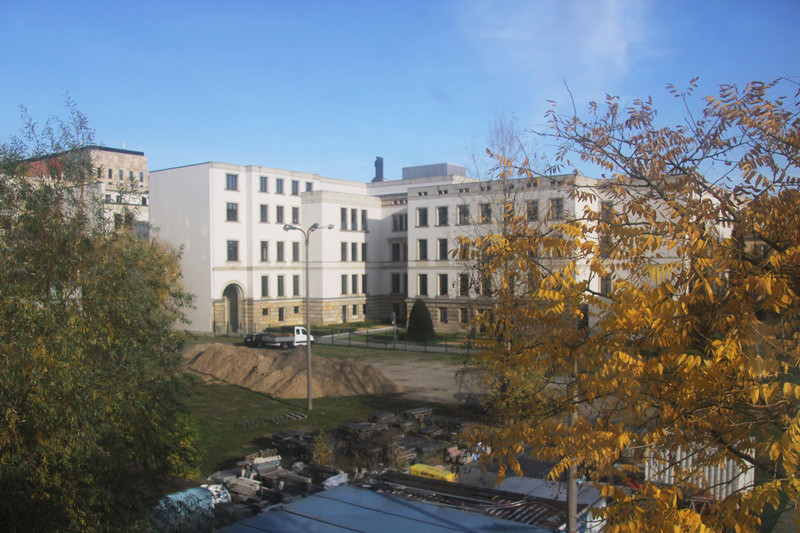 All this doesn’t come cheap – the projected budget is 3.5 – 4 million Euros. For now you’ll have to content yourself with the analogue version and the use of your imagination. 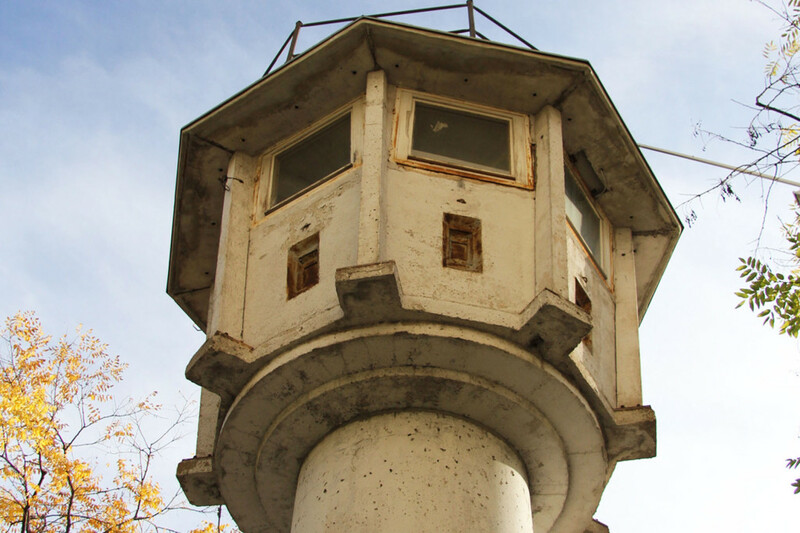 The BT-6 Berlin Wall Watchtower on Erna-Berger-Straße near Potsdamer Platz is open Monday – Sunday from 11:00 to 17:00 (check the Berlin Wall Expo website for up-to-date info), except in wet weather and you can climb the tower for 3,50€.